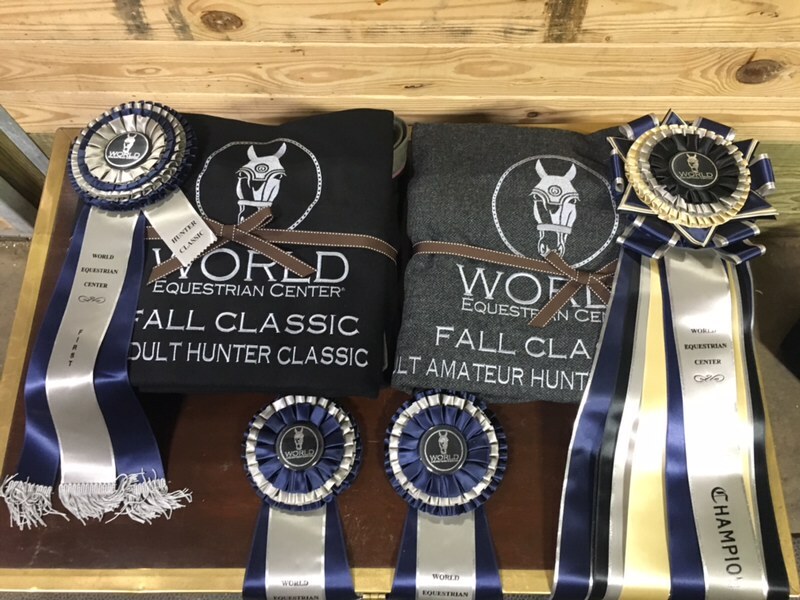 Antioch, IL – October 23, 2018 – Diane Carney/Telluride of Antioch, Illinois, had their first outing at the World Equestrian Center (WEC) in Wilmington, Ohio, this past week, returning home with numerous championships and rave reviews about their experience. 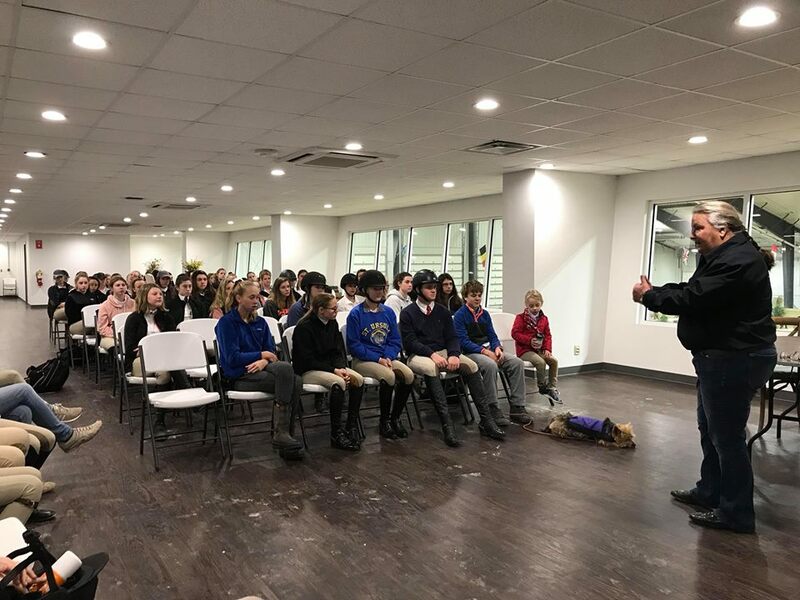 Carney applauded the facility for their commitment to education with the Cadets Horsemanship Program, which allows riders to learn from a variety of equestrian professionals each Saturday morning during a WEC event. Not only do participants get to learn, but also 40 cadets receive a $250 credit on their horse show bill and one lucky cadet earns a $500 credit. The program gives away approximately $250,000 to juniors in horse show credits annually. 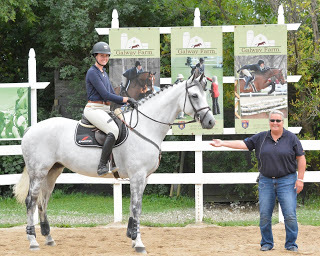 Carney was the guest speaker last week, giving riders a judge’s perspective on turnout for the show ring. Follow the program on Facebook. 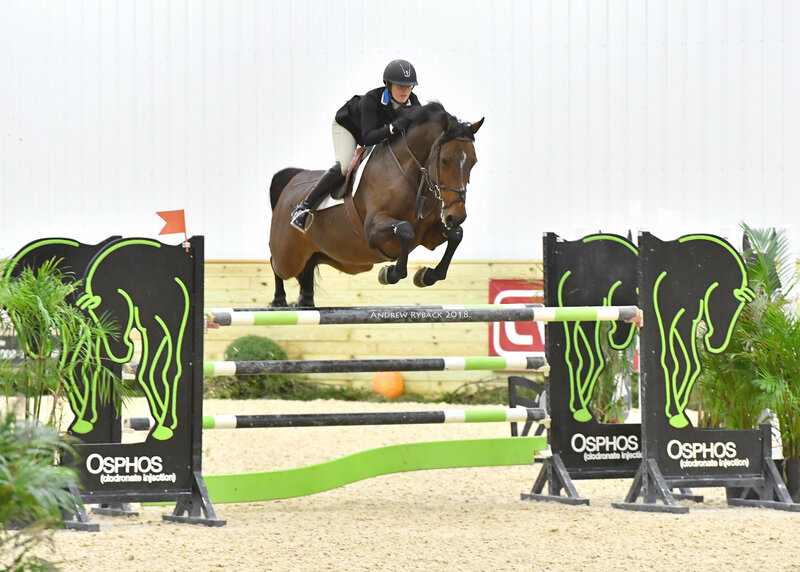 In their commitment to education, the WEC will also host the first Central USHJA Gold Star Clinic, part of the USHJA Emerging Jumper Rider Program, April 16-20, 2019, for qualified and invited riders. Carney coordinates the three clinics which include the East Coast at the Jim Brandon Equestrian Center in West Palm Beach, Florida, December 26 – 30, 2018 and the West Coast at the HITS Desert Horse Park January 16-20, 2019. For more information on the Gold Star program visit the USHJA website. “From the accommodations right across the street and the food on site to the stabling and organized staff, it’s easy to be here and it will be a perfect venue for the Gold Star program,” added Carney. Telluride rider Caitlin Hope Rose, took home several of the trademark WEC blue ribbons for her wins in the Junior/Amateur Jumpers. 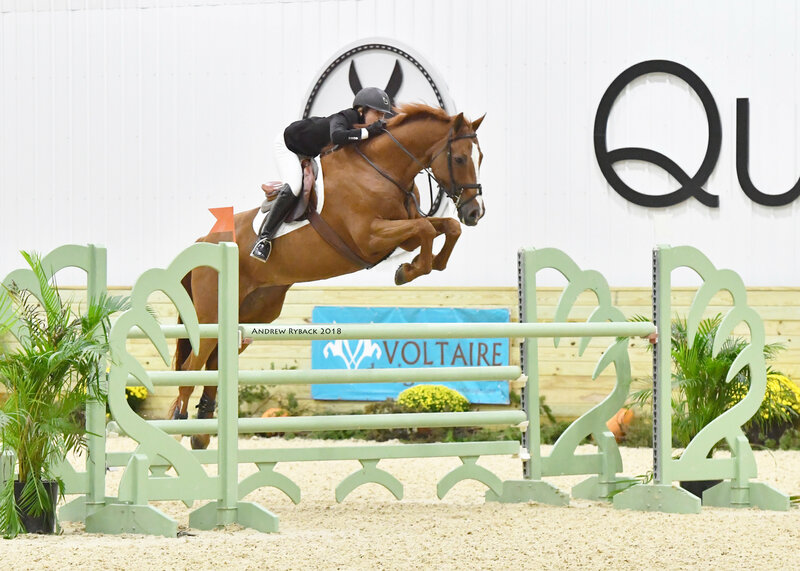 Rose rode Kathleen Hope’s Total Touch to the win in the $2,500 NAL Low Junior/Amateur Jumper Classic as well as a first and second place finish in the division classes to earn the reserve championship. The duo has been together now for 10 years with a prestigious resume including top ribbons at the Pennsylvania National Horse Show, the National Horse Show and Spruce Meadows. 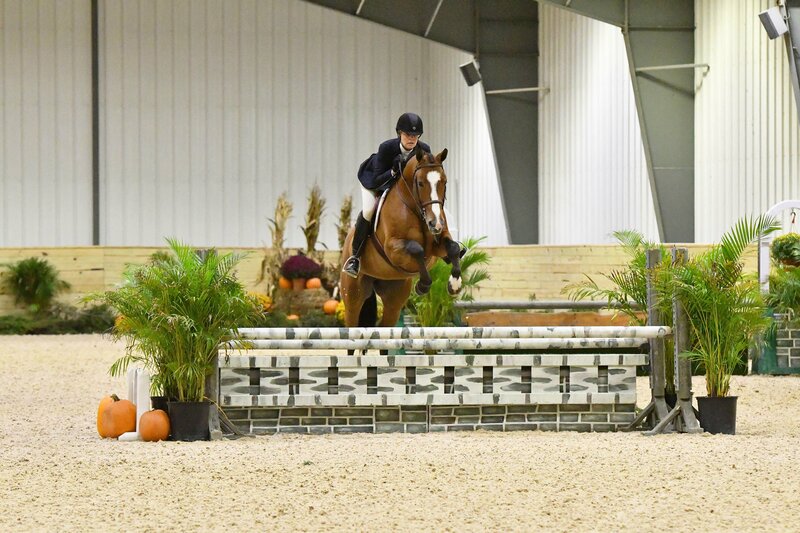 Rose also jumped to the reserve championship in the Medium Junior/Amateur Jumpers on Vision EH. The team earned second place in the $3,000 NAL Medium Junior/Amateur Classic as well as a win in the division. Debbie Kirsch and Naples Bay took home the championship in the Adult Amateur Hunters. PC Andrew Ryback Photography. Adult Amateur rider Debbie Kirsch rode her Naples Bay to the championship in the 36 and over hunters with three wins including the classic. David Beisel also rode Kirsch’s hunter to top ribbons in the Low Hunter division. Special thanks goes to Serah Vogus for keeping the horses in competition shape at home. Debbie Kirsch's prize collection of WEC trademark ribbons for her numerous wins. Carney heads to Wellington, Florida to judge this week and in November will judge the USHJA Championships in Las Vegas. More on the November calendar is the annual George H. Morris Chicago Clinic Carney coordinates on Thanksgiving weekend, November 23-25, at Rush Weeden’s Brookwood Farm, located at 18752 Edwards Road in Antioch, Illinois. Auditors are welcome for $100 per person per day, no reservation needed. The clinic runs from 9:00 am to 4:30 pm daily with lunch included. A book signing sponsored by Rider’s Boutique will take place Saturday at 5:30 pm. For more information contact Diane Carney at 847-922-6167 or dtelluride@aol.com. Visit the website at www.telluridefarm.com. Diane Carney is a lifelong, dedicated horsewoman, emphasizing horsemanship in every aspect of her world. Her versatility and in-depth knowledge as a grand prix rider, hunter rider, clinician, USHJA certified trainer, event organizer, commentator, course designer, USEF R judge, USEF International Disciplines Committee member and USHJA Board of Directors member, gives her a well rounded perspective on the industry. Carney’s judging resume includes the 2016 ASPCA/Maclay Medal Finals, the New England Equitation Championships, WEF, HITS Thermal, Bend Oregon, Blenheim CA, Flintridge and Sonoma, CA; LA Masters, Kentucky Summer, The Ridge at Wellington, the Sunshine Series USHJA $100,000 Hunter Prix, HITS $500,000 Hunter Prix, EA and IHSA, the USEF Pony Finals, Gulfport and the West Coast Equitation Final at the USHJA Championship. For more information on Diane Carney, visit the website at www.telluridefarm.com.